Diribani and Tana are stepsisters who are trying to provide for Tana’s mother ever since Diribani’s successful father died and left the family with nothing. 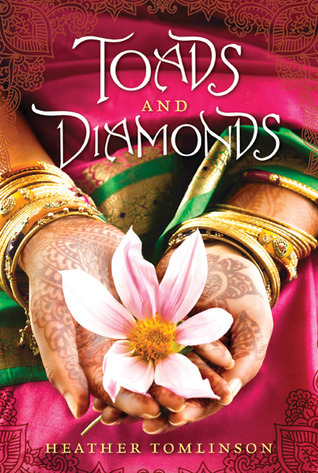 One day, when each of them makes a fateful trip to the local well for water and has a run-in with the goddess Naghali, their words begin to turn in to objects as they speak- Diribani speaks flowers and precious jewels, while Tana speaks toads and snakes. The prince of their region soon gets involved and determines that Tana should live a secluded life in a holy grove, and Diribani will join the royal caravan back to their palace. Both girls accept their new lives dutifully, making sure to remember that the goddess must have a plan for their new gifts. Soon, though, it becomes clear that the people of their community who do not agree with their religion and think them witches are out to ruin them, and they both find themselves trying to thwart danger while also protecting the people they love. This beautifully written tale is based on the classic fairy tale titled “The Fairies” by Charles Perrault. The kingdom that the author sets the story in is based loosely on Indian regions, but is essentially fictional. Give this book to any readers who loves re-written fairy tales, beautiful descriptions, representation of multiple religions, or strong female characters.